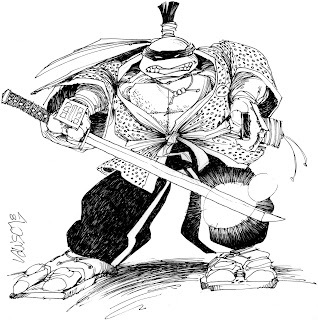 Blast from the Past #184: Lawson/Eastman "Samurai Turtle"
I came in to the office today to grab a bicycle for my daily ride, and took some TMNT #30's with me, thinking I might find a nice spot somewhere along the way to do more head sketches. I ended up sitting in the shade on some steps at Smith College, and enjoyed the air while I finished another twenty of them. 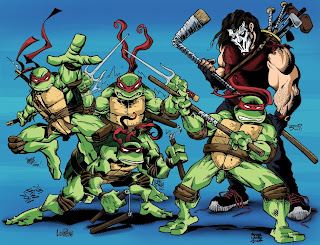 When I got here this morning, I was pleased to find these five copies of TMNT #30 sitting in front of my office door. 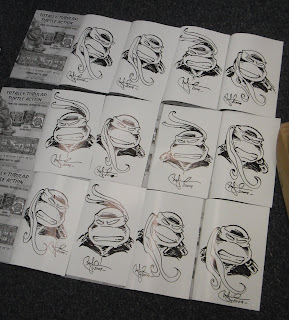 One hundred and twenty-five down, seventy-five left to go! 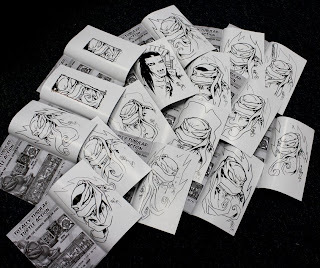 Just finished another twenty-five head sketches in copies of TMNT #30 and gave them to Katie. 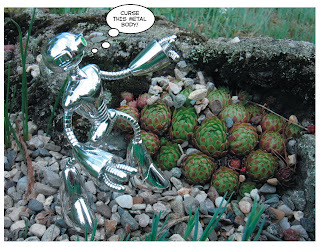 I'm pretty sure this hasn't been posted here before -- I did a search and didn't see it -- but my apologies in advance if I somehow missed it. 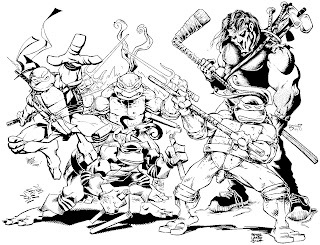 Blast from the Past #182: Jim Lawson "Samurai Turtle"
Berger, Lawson and Talbot Turtle head sketches now available in TMNT issue #29! 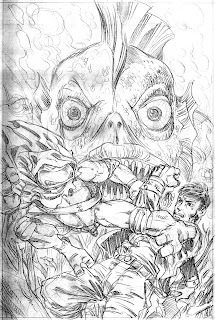 I worked a little bit yesterday and some more today on doing the head sketches in issue #30 of Volume 4, and I managed to do another thirty-three of them. 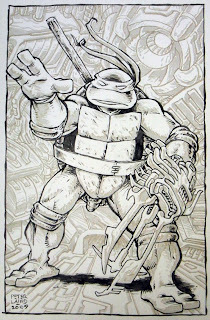 For the ones I worked on today, I used a 90% cool grey Prismacolor marker. 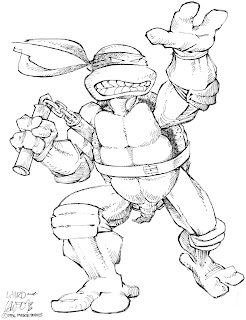 I decided to try this to give a little more variety to the look of the sketches. I like how they came out. 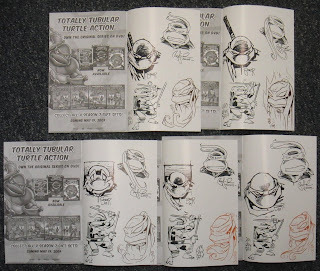 Today I started doing the promised head sketches on the inside back covers of our copies of TMNT Volume 4 #30. I got these twelve done this afternoon. 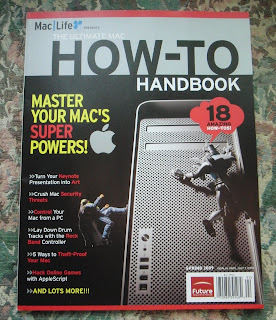 It was "new magazine day" at Barnes and Noble two days ago, and I picked up this special issue of "MacLife", mostly because my eye was drawn to one element of the cover. 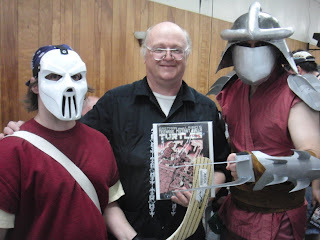 Here are a few more photos from Free Comic Book Day last Saturday in Rochester, NH. 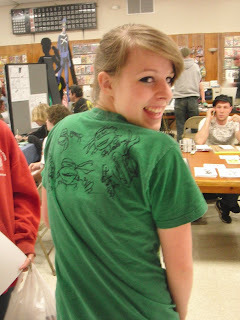 This first one is of a young lady named Meagan Windham, who asked for -- and got -- her shirt signed by all of the Mirage dudes. 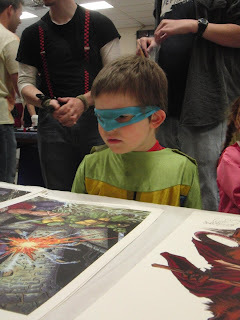 This little dude below is, I think, one of those "second generation" TMNT fans we've started to encounter at shows. These two gentlemen came in their cool homemade costumes -- that's Brandon Berry as Casey Jones, and T.K. 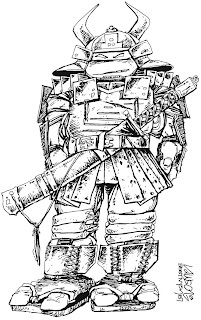 Travis as the Shredder. 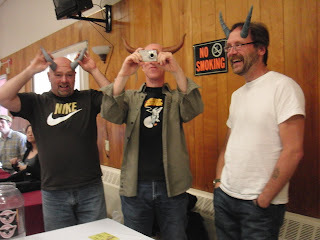 There were some folks selling these cool horns at the show -- they're held on by elastics, and really fit quite well. I like how the positioning of the camera's lens in this one of Mike Dooney about to take a photo makes him look kind of like some weird Cyclops. 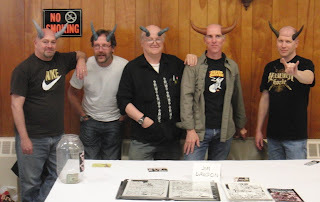 And here we all are, modeling the latest in demonic cranial excrescences. 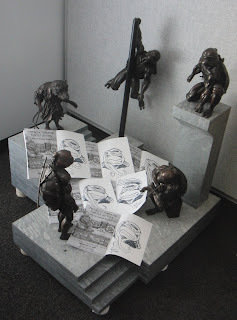 I'm back home after a busy, somewhat exhausting day at Free Comic Book Day in Rochester, NH. 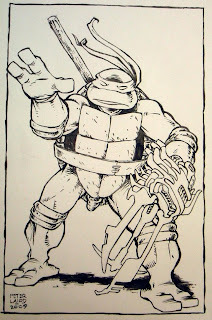 This event was put on by Ralph DiBernardo of Jetpack Comics (that's the name of his store in Rochester). Jim, Mike, Dan, Steve and I got there a little bit before 10AM, and I was signing almost non-stop from then until about 3PM, with a little break for lunch (ten minutes, at the table). As the event wound down towards its close at 4PM, I took advantage of the moment to take the photos which make up this panoramic view from my seat at the Mirage Studios tables. 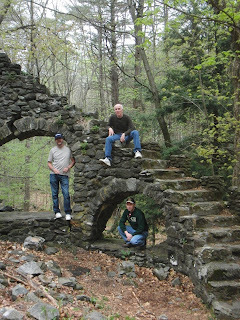 Steve Lavigne and Mike Dooney can be seen on my left, and Jim Lawson is on my right. Dan Berger was behind Mike -- I don't think you can see him in this image. 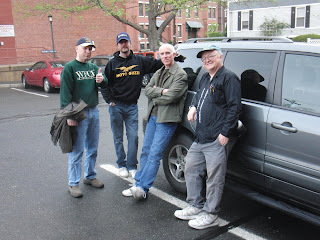 I was originally planning to ride a motorcycle -- probably my Gold Wing -- to New Hampshire for Free Comic Book Day, along with Jim Lawson and Steve Lavigne. Unfortunately, the predicted weather for today and Saturday was just too iffy, and that plan got shelved. 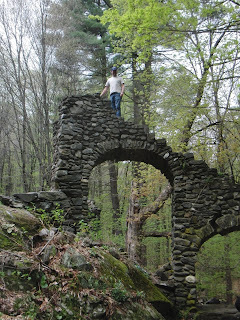 This little digression, plus a stop at the Vermont Deli in Brattleboro (where Mike bought a cookie that was almost as big as his head), and a later one to a Toys 'R' Us for a bathroom break, may have led to our being a little bit late in meeting up with Steve Lavigne in Portsmouth. Okay, it was also my missing the entrance to Route 95, which led us to travel some miles up the coastal road to Portsmouth -- nice views of the ocean, but definitely not as quick.